A2 Bikegeek | Just your random two wheel kind of fun. So this evening I spent an hour watching “The Cross Canada Project” by Mike Beauchamp. He spent 109 days crossing Canada on bike, while filming it at the same time. His reason why to take such a journey was simple, “why not?” I really enjoyed watching his transcontinental trip unfold on film and I think just about anyone will enjoy this film also. I would love to introduce everyone to Common Cycle ! This is a huge advancement for our local community and I truly hope that this will be a great organization that will carry on for years to come. They are currently still in their infancy and working off of their own customized bike trailer/portable work shop but they are going at it with all their heart! They hopefully in the not too distant future be able to acquire a space in which the community can join them for classes, safety tips and have a roof over their heads so they can work on bikes for you too. If you would like to know more about Common Cycle please check out their website at http://commoncycle.org or you can also follow them on Facebook | Common Cycle . 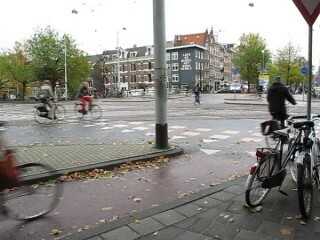 Even though it is gray and wet out in the video I would still love to live there for the biking and other things. 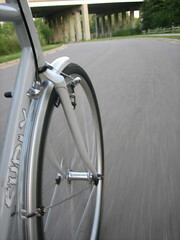 So spring has sprung and your bike might need some new shoes… well tires that is. There is everything from fast rolling to slow rolling tires. Ones that can go flat if you look at them wrong or ones you can ride to hell and back. So what do you want to look for for an everyday tire that you can use rain or shine? Well that is not to hard, but it is not always the cheapest. With initial purchase you will put some money upfront ($35-45 per tire) but the amount you will save on flats will compensate for the price. I am a huge fan of Continental – Gator Skins and Specialized – Armadillos . Both of these tires are comparable and both utilize Kevlar as a protective layer, I have never had a flat yet with them, I’ve even torn chunks out on nasty pot holes that would of otherwise destroyed any other tire. These are both available in a very wide range of sizes, everything from 26inch slick MTB tires to high volume and race/road/training low volume 700c models. These next tires are also great for commuting and or touring. They incorporate flat resistant protection, have large volumes of air for comfy riding and work great. 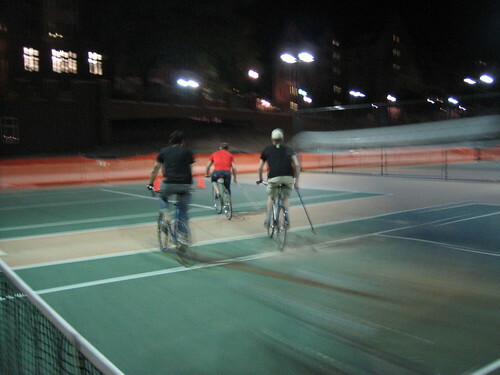 These two are Continental – Contact and the Panracer – Pasela . Both of these tires are great options for year round use in all conditions. 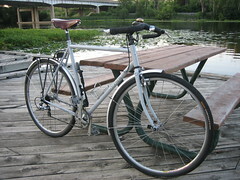 I have a set of the Continental – Contacts on my Surly Cross-Check , they have been great. They are also one of the tires that come on the complete Surly Long Haul Trucker. Ok, that’s enough plugging for tires now lets talk about why different tires are better for different types of bikes and riding. Skinny road tires, they are great on bikes when you want to go fast but you do pay for the price of comfort, since these tires have a lower air volume you are required to run them at a high pressure. That high pressure translates into a lower rolling resistance since the tire is not making such a large contact patch with the ground, but then the tires cannot absorb a whole lot of the impact from bumps and pot holes causing a rougher ride on anything but the perfect road surface. Using a larger volume model of a similar if not same tire model will result in a smoother and less jarring ride due to it’s increase in air volume and ability to be run at a lower air pressure. Now if we look at the larger volume touring/commuting tires you will notice that they don’t roll as fast or as easily as the road style tires. This is of course due to the increase of the tire patch with the ground and the lower air pressure. The results are a more comfortable experience on uneven surfaces due to the tires absorbing the impact. Here is some more info on tires via Rivendell Bicycle Works , also their Pick a Tire Chart and last but not least the plethora of information from none of than Sheldon Brown – Tires. And as always the best thing you can ever do to avoid flats is to keep you tires pumped to the right pressure, even more important than avoiding tiny chunks of glass. “(CNSNews.com) – Transportation Secretary Ray LaHood has announced that federal transportation policies will no longer favor “motorized” transportation, such as cars and trucks, over “non-motorized” transportation, such as walking and bicycling. I thinking the restructuring of the funding will greatly help us increase the amount of infrastructure and trails within our communities. There are many locations close to many people that just don’t have the adequate infrastructure to get people there without motorized transport which is truly a shame. Phil Wood – Rest in Peace. I have recently found out through Bicycle Retailer and Urban Velo that Phil Wood has recently passed away at age 84. Phil Wood helped pioneer sealed bearing technology in bicycles, primarily in hubs and bottom brackets. Phil Wood created a clearly superior hub that has yet to be rivaled in my opinion. Overbuilt for longevity, sealed bearings that felt like butter not matter what conditions they are in. 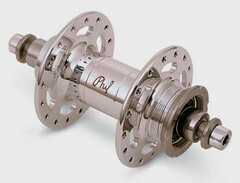 The bearings for the Phil Wood track hubs even will go into cheaper Formula Track hubs. I think all of us in the cycling world have nothing but thanks and well wishes for the Wood’s family after sharing Phil with us for so long.